This contemporary three bedroomed beach house is surrounded by native bush and has been landscaped with indigenous native plants. Decorated with exceptional attention to detail, it has all the modern comforts and space for a private romantic couple, family or group of friends. 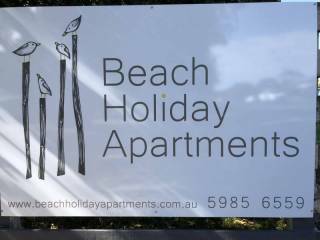 Located on the Ocean Beach at Rye this property is approximately 500 metres walk to the area known as Sixteenth Beach and the National Park walking track. The large lounge dining has stylish furniture and the modern kitchen area is light and bright with aspects out to the front and rear of the property. A flatscreen TV with foxtel and wifi gives you all the mod cons. 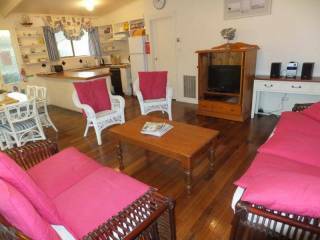 There is a second lounge room with another flat screen TV and leather chaise for relaxing with a movie (or a place to put the kids). You'll have everything you need for a self contained stay. The three bedrooms are large and can accommodate up to six guests with king beds in two of the rooms. All rooms have built in wardrobes and one has its own ensuite. Garden: The rear garden has native plantings and bush and is fully fenced and so is the spa area. We would ask guests not to allow pets in the spa area and absolutely not in the spa itself. Fencing: Fully fenced rear only with 6 ft fencing.